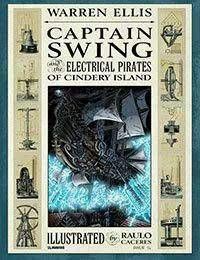 From the sparking-mad mind of Warren Ellis, the creator of AETHERIC MECHANICS and DOKTOR SLEEPLESS, comes an electrical romance of a pirate utopia thwarted: CAPTAIN SWING &amp; THE ELECTRICAL PIRATES OF CINDERY ISLAND. This crackling mini-series is illustrated in Raulo Caceres stunning woodcut style, and presented in full color. London, 1830: newly-minted copper Charlie Gravel keeps seeing things hes not supposed to. A crooked Bow Street Runner with a flintlock revolver, flying things that are not supposed to fly, and the violent Scientific Phantasmagoria that is christened Spring-Heeled Jack, but is known by other names. It is the time of Captain Swing and his Electrical Pirates, and history will never be the same.